Made with love by Br. Basil Taylor, OSB, a monk who grew up in Subiaco’s own back door--Ft. Smith, AR! Br. Basil entered the novitiate at Subiaco Abbey on Feb. 8, 2013 and brought with him a wealth of knowledge in electronics and computer support. 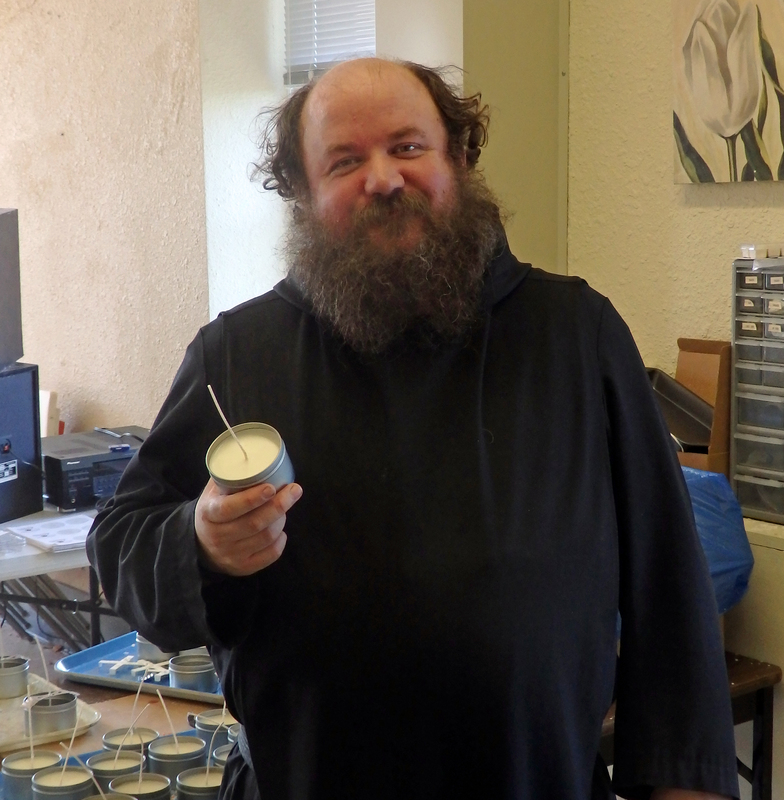 "When I joined the monastery there was currently no one that was making candles. In the past there had been a couple of monks who made the candles that we use in the church. In one of the sacristy work rooms there is a wall of cabinets and they were just full of candle stubs. Instead of just throwing them all away when we started to clean that room out, I went and asked around to see if anyone knew anything about making candles. No one did but they pointed me to a little building down below the east end of East Park called the bee house. This little two-story building was where one of the brother monks had at one time set up for harvesting wax and honey from his many bee hives around the monastery. Not needing the large wax processing equipment that had been used in the past, permission was given for me to move what was needed into one of the towers in the monastery. Soon after starting to melt down and remold the church candles, I had a number of people ask about scented candles for themselves, so after some research and lots of failed experiments, this is what we now have. Our candles have become a best-seller in our own Coury House Gift Shop. We now offer them to you through our online store."